Going solo. Does that mean alone? I just got back from a weekend climbing in Crest Creek with an amazing group of 15 women. It was such a joy to co-lead this trip with my two friends, Brianna and Krista. 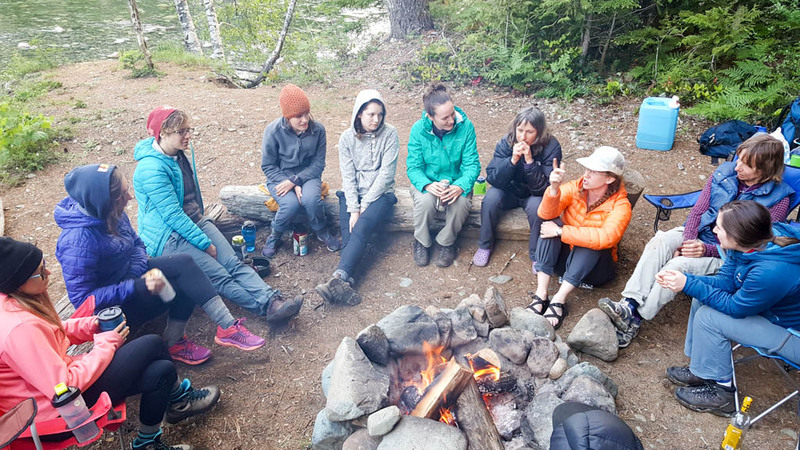 It was our second “Wild Women” trip that we’ve organized for the Alpine Club. Unlike most Alpine Club trips, most of the people in our group were in their 20s and 30s. (The youngest was 18!) We also had several more experienced folks along, which helped round out the group. When I pull off the road to camp on a logging road, I am usually a bit worried. Who else will be there? Someone loud and domineering? Someone dangerous? I didn’t even notice that I felt this way until I pulled into our spot and the knot in my stomach started to untangle. Camping in a remote place has never felt safer and more appealing. Everything I’ve learned about Crest Creek come from being there, in person. Trying out routes. Talking to my fellow climbers. Talking to the Heathens who developed the area. Information like this that is passed down through word of mouth can be very difficult for some people, especially women, to access. Finding a climbing mentor as a young woman can be filled with unwelcome complications. I don’t pretend to be an expert on Crest Creek, especially I’ve only been climbing for 5 years. But I love it there. And it felt good to share this information with other women, in an uncomplicated way. I loved that everywhere I looked, I saw and heard other women cheering each other on. For some people, challenging themselves meant setting up a top rope and giving it their all. For some others, it meant leading for the first time in a while. Sarah takes a moment to compose herself before she takes a big step onto this ledge. No hand holds up there! I often feel embarrassed about how “easy” my projects are and wasting my partner’s time. So I just climb easy things or give up as soon as it gets hard. This weekend, Kara and I practiced not giving up. The first day we spent hours trying to lead two difficult and slightly run out routes. We did not get far. By the end, my fingertips felt like they were on fire. I’ve never climbed that hard before. Finally breaking out the top rope as it was getting close to 7pm. After a day of suffering, I picked a less scary but still hard route. And I got up it! My experiences the day before made this one seem like a breeze. 5. Being surprised and delighted. When Brianna announced her plans for an evening of climbing games, I was concerned. Who would want to spend their evening doing a knot relay race and a plank competition? Turns out we did. All of us big climbing nerds did. Krista going over essential climbing knots before the relay race begins. The winner held this position for over 3:30 minutes. I also learned that the more wine I drink, the faster I can coil a rope. One of my lessons learned was around using more inclusive language. It was important to all three of us organizers that our “Wild Women” trips were queer and trans-friendly. We advertised the trips as open to “self-identified” women. I got a bit of feedback that we could have said something even more inclusive. One suggestion was saying it was open to anyone who identifies as a woman in the past, present or potentially in the future. I liked that and I hope we can do an even better job of getting more people stoked on climbing in the future. I love being outdoors, especially in the mountains. I live on Vancouver Island on the west coast of Canada. No, social media is not ruining hiking. Let me know if you do this type of womens trip again, I’m interested!! !